This highly enjoyable 1960 movie about a botched blackmail suggests Japan’s answer to a scrappy film noir bankrolled by RKO. Many film buffs rightly point to Akira Kurosawa’s High and Low (based on Ed McBain’s King’s Ransom -– an 87th Precinct police procedure novel) as proof positive that 20th century Japanese cinema had the nuts and bolts to make the mystery genre its own. 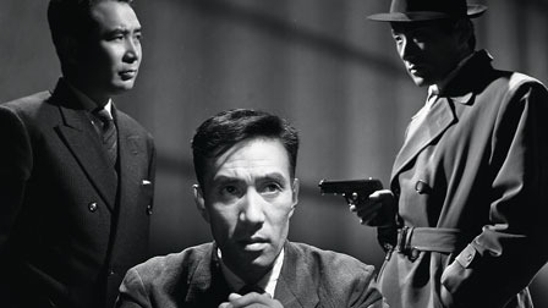 If High and Low can be likened to Double Indemnity, then Koreyoshi Kurahara’s Intimidation -– a brisk and highly enjoyable 65 minute film about botched blackmail playing as part of a Nikkatsu celebration at the New York Film Festival -– suggests a scrappy film noir bankrolled by RKO. Despite their differences in budget and running time (which could very well be directly proportional), both films carry striking similarities. They both involve upwardly mobile executives, on the cusp of influencing corporate direction through somewhat idiosyncratic cunning, who are forced to contend with a criminal scheme introduced by an apparent outsider. Yet in their own distinct ways, both High and Low and Intimidation have interesting points to make about reputation. Kurosawa offered a timid chauffeur staring at the big man’s shoes, suggesting that all inside the circle are at the behest of outside forces. For Kurahara, corruption and deceit are contained within the system, with the police entering into the narrative after all the pros have failed: not unlike the diffident manner that the United States has responded to avaricious bankers in recent years. Kurahara introduces a seemingly meek clerk named Nakaike (Akira Nishimura, who, with his sad look and timorous eyes, may be Japan’s answer to the great character actor Elisha Cook, Jr.) who has been under a bank manager’s (Takita, played by Nobuo Kaneko) spell for years thanks to a few ruthless setbacks. Nakaike long-hoped for something close to an equal footing, especially since he had a shot at being where Takita is now. But, of course, it isn’t just bitter memories. In one heartbreaking scene, Takita humiliates Nakaike over “security training” that has gone awry. That this self-serving moment comes after Kurahara has asked us to sympathize with Takita is something of a surprise. But the unanticipated ace up Nakaike’s sleeve is so viscerally rewarding that I cannot possibly reveal it! Intimidation begins with a suitably mysterious image: a man with a gun, a fedora, and a cigarette in his mouth opening the service entrance door of a bank and asking for the sub-manager. Takita, the sub-manager in question, is too busy partying it up with the branch manager, geisha girls, and asking subordinates such as Nakaike to dance on command. He’s about to land a promotion. But Takita does get the message when he meets with the blackmailer, who has evidence that he authorized several illegal loans. Takita is asked to cough up three million yen the day after tomorrow. The blackmailer suggests that he rob his own bank. Because nobody would expect “the lighthouse to shine on itself” and this is the kind of move that you wouldn’t expect in a detective story (okay, not really; but give the filmmakers some credit for momentum! ), Takita agrees to the deal. What makes Intimidation engaging is the way that it uses class trappings to buttress the robbery. Why indeed would a sub-manager rob his own bank? We get the sense that it isn’t necessarily the blackmailer’s pressure, but the sub-manager’s quiet arrogance that gets him to rob the bank, wearing a sketchy disguise and donning a cigarette lighter in the form of a gun. But, of course, he screws up the robbery from the outset, cracking his sunglasses not long before putting on his feeble costume. Takita is so flagrant in his plans (getting the clerk on night duty drunk the night before) that we begin to wonder why nobody else can see his moves. (Hilariously, the branch manager even confesses, “I don’t understand much about this business.” In light of Reed Hastings’s recent disastrous moves with Netflix, I couldn’t help but ponder contemporary parallels days after seeing this movie.) But Intimidation also proves surprisingly smart in this capacity, knowing very well that there are climbers embedded within the bank and that those who are spurned hardly depart with ease. While Intimidation appears to have been made somewhat on the cheap (the bank’s brick walls look quite fake), this flimsy décor somehow works to the film’s advantage, almost as if Takita’s position is just as tenuous. This may have something to do with the crackerjack story, the film’s fixation on camera dollies over zooms, and Kurahara’s understated direction, which is especially good on the acting front. After all, if we can’t believe in a bank manager’s integrity, we wouldn’t be so drawn into the story. Perhaps there are some common verisimilitudinous qualities about art and business that help sustain the illusion.